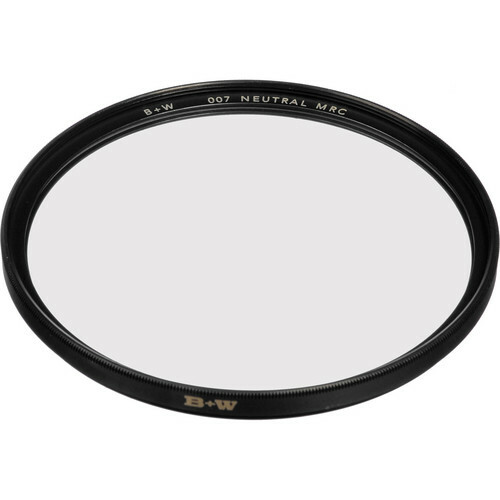 The B+W 112mm Clear MRC 007M Filter is a simple, clear filter with a 1x filter factor and is designed to provide general protection for your lens. This optically clear filter does not affect overall image quality while helping to reduce dust, scratches, moisture, and other elements from damaging your lens. To prevent internal ghosting and reflections while providing over 99.8% light transmission, each glass surface includes eight layers of anti-reflection coating. This Multi-Resistant Coating (MRC) also offers greater protection to the filter substrate and helps it to stay clean for longer than with uncoated filters. F-Pro brass filter ring helps to prevent vignetting, jamming, and provides additional strength. Padded pouch for storage and transport. Box Dimensions (LxWxH) 7.0 x 6.4 x 1.3"
112mm Clear MRC 007M Filter is rated 4.0 out of 5 by 2. Rated 4 out of 5 by JP from Works for Canon 17x120 cine zoom but,... Fits the Canon 17x120 Cine Zoom but you cannot use the stock sunshade that comes with lens. The filter is just a hair bigger. Also I recommend using a very very tiny bit of Anti-Seize on the threads, or you will never be able to get it off. Also the Canon lens cover make a perfect wrench to grab and screw lens all the way on as well. Canon BTW has no Clear Filter for this lens and has no current plans to do so. Rated 4 out of 5 by Jason from Works with Canon 17x120 but... I bought for Canon 17x120mm cine servo lens, works but it is just a hair too big to use the Canon Sunshade that comes with lens. Also the lens cap that comes with lens, is a good wrench to seat the filer all the way on lens. Note: use just the smallest amount of Anti-Seize on the filter threads or you'll never get it off again.